The capability of a class to derive properties and characteristics from another class is called Inheritance. Inheritance is one of the most important feature of Object Oriented Programming. Sub Class: The class that inherits properties from another class is called Sub class or Derived Class. Super Class:The class whose properties are inherited by sub class is called Base Class or Super class. Why and when to use inheritance? Using inheritance, we have to write the functions only one time instead of three times as we have inherited rest of the three classes from base class(Vehicle). Implementing inheritance in C++: For creating a sub-class which is inherited from the base class we have to follow the below syntax. Here, subclass_name is the name of the sub class, access_mode is the mode in which you want to inherit this sub class for example: public, private etc. and base_class_name is the name of the base class from which you want to inherit the sub class. Note: A derived class doesn’t inherit access to private data members. However, it does inherit a full parent object, which contains any private members which that class declares. In the above program the ‘Child’ class is publicly inherited from the ‘Parent’ class so the public data members of the class ‘Parent’ will also be inherited by the class ‘Child’. Public mode: If we derive a sub class from a public base class. Then the public member of the base class will become public in the derived class and protected members of the base class will become protected in derived class. Protected mode: If we derive a sub class from a Protected base class. Then both public member and protected members of the base class will become protected in derived class. Private mode: If we derive a sub class from a Private base class. Then both public member and protected members of the base class will become Private in derived class. Note : The private members in the base class cannot be directly accessed in the derived class, while protected members can be directly accessed. For example, Classes B, C and D all contain the variables x, y and z in below example. It is just question of access. // doesn’t inherit access to private data members. Single Inheritance: In single inheritance, a class is allowed to inherit from only one class. i.e. one sub class is inherited by one base class only. Multiple Inheritance: Multiple Inheritance is a feature of C++ where a class can inherit from more than one classes. i.e one sub class is inherited from more than one base classes. Here, the number of base classes will be separated by a comma (‘, ‘) and access mode for every base class must be specified. Please visit this link to learn multiple inheritance in details. 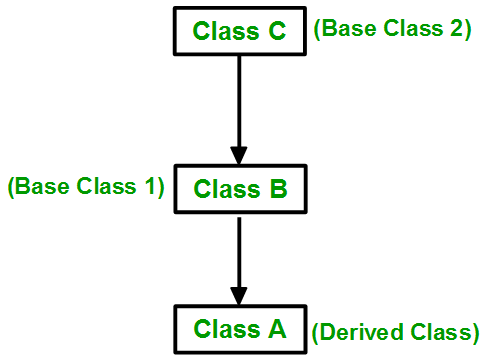 Multilevel Inheritance: In this type of inheritance, a derived class is created from another derived class. 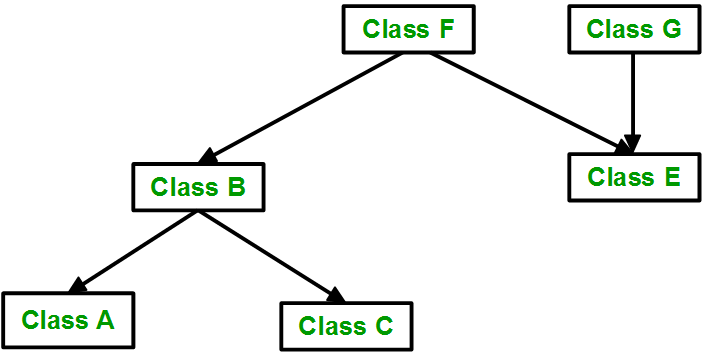 Hierarchical Inheritance: In this type of inheritance, more than one sub class is inherited from a single base class. i.e. 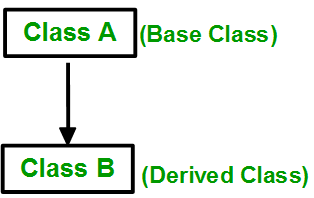 more than one derived class is created from a single base class. Hybrid (Virtual) Inheritance: Hybrid Inheritance is implemented by combining more than one type of inheritance. For example: Combining Hierarchical inheritance and Multiple Inheritance. first_page How to transform Vector into String?